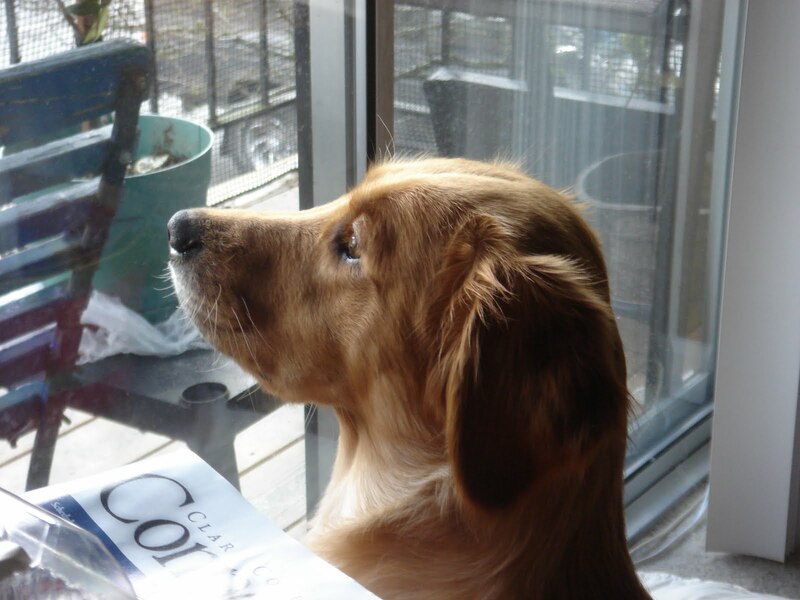 Kaylee is a 14-month-old Golden Retriever, very affectionate, enthusiastic, and way too full of energy. Last Thursday we were going to run some errands. I was walking Kaylee through the parking lot to the car when she spotted her favorite person in the world, Mike. Immediately, she dashed in his direction, yanking me along with her. What followed would have been a big hit on YouTube, had anyone been filming. I flew off my feet, into the air, and hit the wet, dirty pavement, face down, bruising my knees, & skinning my palms as I landed. The leash was jerked from my hand, and my right shoulder was felt as if it had been pulled out of the socket! I hadn’t realized there were that many people outside, but instantly there were at least 7 neighbors around me, as well as Steven & Mike, all asking if I was okay, and exclaiming over what had happened. “Did you see how she flew? I’ve never seen a dog do that to a grown-up before!” I heard someone say. As I cradled my arm against my chest, and headed back inside to change my now wet & dirty clothes, I reminded Mike “Do NOT give that dog any treats! !” Because this, of course, is why she loves him more that anyone else. Mike is the maintenance guy for our apartment complex, and in his storage room, keeps bags of expensive treats for all the dogs that he hands out like candy! All the dogs adore him. Later that evening Steven took me to the ER, where they told me I had an Acute Shoulder Strain, gave me some exercises & pain meds. Since then, I can’t lift more than I medium-sized book, and even that is sometimes painful. It’s hard to write; I can’t lift my hand above my head. Ouch. If that was all, I wouldn’t wonder about the dog, but I’m starting to wonder. A month ago, she pulled so hard on the leash I fell down the stairs, and then a week later, she jumped on me when I was on a stepladder, knocking me off. If I see a shadow on the shower curtain, and hear the theme song from “Psycho,” I’m gonna know it’s her! I think she’s out to get me just because I won’t let her sleep on the bed. With me out of the way, she’ll have Steven all to herself, and can sleep anywhere she wants–sofa, bed, kitchen sink! Nobody will complain “That dog needs a bath!” or that she has toys all over the place. So if I suddenly end up dead in an odd dog-related accident, you will all know it was no accident! Make sure the dog is prosecuted to the full extent of the law–and do NOT let her sleep on my bed!! Don't flatter yourself. She's not trying to kill you. She just doesn't care if you die.You actually flew through the air? See, this is a great reason why people should never lose weight.